Baastrup’s Disease, generally known as Kissing Spine, is characterised by degenerative changes of both the spinous processes and interspinous soft tissues of two neighbouring vertebrae. This syndrome was first diagnosed by Baastrup in 1933. 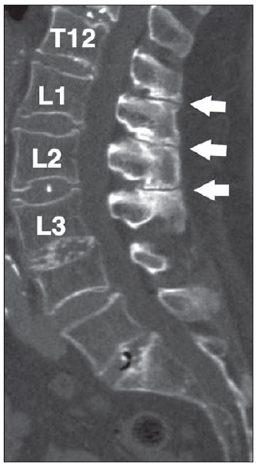 It is described as a condition where adjoining lumbar spinous processes become closely approximated to one another, resulting in the formation of a new joint between them., , , Kissing Spine mainly affects the lumbar area of the spine, with L4-L5 being the most frequently affected level , but it has also been reported in the cervical spine. Kissing Spine has numerous consequences such as the formation of hypertrophic spinous processes, which can lead to mechanical back pain in combination with degenerative disc disease. In some cases, the syndrome can also evoke neuromuscular damage. The lumbar spine, consisting of 5 separated vertebrae, is located between the thoracic spine and the sacrum. Those five vertebrae are the largest of the spine and increase in size from superior to inferior. The lumbar vertebrae consist of various parts, in particular the vertebral body, the posterior elements (one process spinous and two processes transversus) and two pedicles. Due to the weight-bearing function of the lumbar spine, the lumbar vertebral bodies are larger than the other vertebral bodies of the spine. The processes spinous are thick and broad, and are dorsally and caudally orientated. The pedicles are the junction between the vertebral body and the neural arch. Stability of the lumbar spine is necessary during functional activities. This is primarily obtained by the muscles, which are attached to the posterior elements of the vertebrae, therefore, the spinous processes are subjected to major forces during movements. Along with the muscular structures, ligaments also provide a stabilising function and as a result they also undergo large compressive loads during movement. A few studies have investigated the influence of the age on Baastrup Syndrome. DePalma et al. demonstrated that the average age of patients with Baastrup’s disease is 75. which was supported by Maes R. et al. that Baastrup Syndrome is more common amongst elderly persons, but this does not preclude incidence in younger individuals. The effect of gender is still unknown, so further research is necessary. The cause of pain is described as being mainly mechanical due to the neighbouring spinous processes coming into contact. Pain worsens with hyperextension or increased lordosis which can been seen in patients with obesity, limitation in hip movements and pro/elite swimmers. Baastrup syndrome can occur independently or together with symptoms of other disorders, such as spondylolisthesis and spondylosis with osteophyte formation and a loss of disc height. The precise prevalence in the population remains still uncertain, but Kacki et al. suggest that this disease may be common, given the relatively frequent abnormal changes of the interspinous spaces. reactive sclerosis of the superior and inferior fragments of adjacent processes. CT scans can also report on detailed degenerative changes (e.g. facet joints hypertrophy, intervertebral disc herniation or spondylolisthesis). 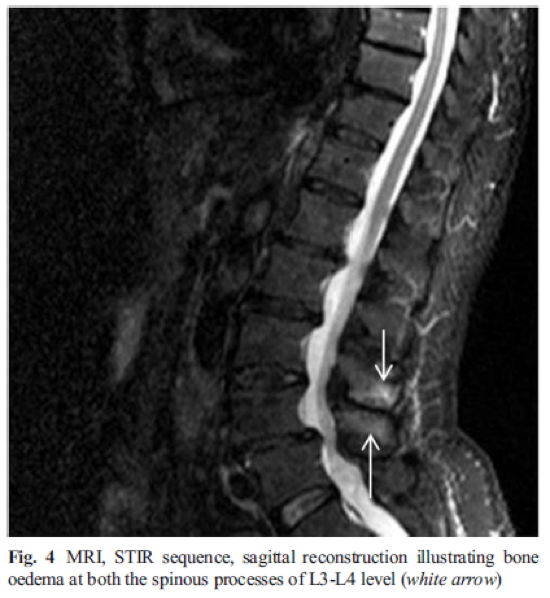 However, this type of diagnostic procedure is limited in the assessment of disc degeneration and soft tissue imaging, which means that interspinous bursae cannot be seen. General degenerative changes in the spine. X-rays have a lower cost, are more readily availability and give a relatively low ionising radiation dose. The disadvantage of radiographic imaging is poor imaging quality, in particular, at the lower lumbar fragments. Similar to a CT scan MRI shows any flattening, sclerosis, enlargement, cystic lesions and bone oedema at the articulating surfaces of the spinous processes. 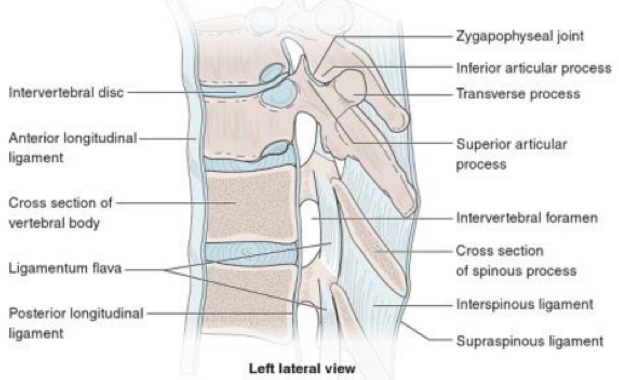 This type of diagnostic procedure is extremely beneficial in determining whether there is a compression of the posterior thecal sac as an outcome of this contact of the interspinous processes. Further advantages of MRI imaging also include no ionising radiation and a highly detailed image at various levels (axial, coronal and sagittal). Baastrup’s Syndrome is regularly misdiagnosed and often incorrectly treated. A thorough clinically assessment and scrutinising of radiographic imaging are vital for an accurate diagnosis and to prevent mismanagement. Diagnosis of Baastrup’s disease is verified with clinical examination as well as imaging studies. Symptoms include low back pain with midline distribution that exacerbates when performing extension, relieved during flexion and is exaggerated upon finger pressure at the level of the pathologic interspinous ligament. Rotation and lateral flexion are also very painful. The pain can be described as a sharp or deep ache, often worse during physical activities that increase lumbar lordosis or compression of these structures. Suggested surgical therapies include: excision of the bursa, partial or total removal of the spinous process, or an osteotomy. Average hospital stay is up to 31 days, however, such invasive therapies occasionally have unsatisfactory outcomes and is has been reported that numerous patients have developed pain post-surgery. It is also unclear whether surgery produces better results as an effective outcome has been reported in only 15 to 40 % of cases. Alternative techniques are interspinous spacer devices such as a X-STOP. Zhou et al. describes it as, 'a floating device inserted into the interspinous process to increase the distance between the spinous processes and the intervertebral foramen'. This procedure is more straight forward and is less invasive than the alternatives. When the abdominal muscles are weak, the hip flexors are mainly responsible in shaping the lumbar spine. Furthermore the rectus femoris muscle is a continuation of the hip flexor complex so it is important to stretch these muscles. The hip flexors can become shorter through long-term sitting or resting. When these muscles shorten, it can affect the function of the gluteal and the spinal muscles. 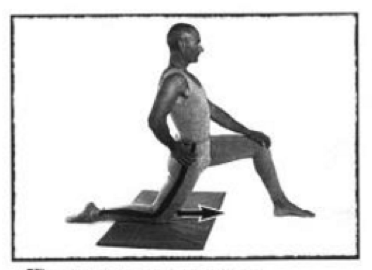 The stretch below is one example of how to lengthen these muscles. Resting the weight on the knee and the front foot, push the hips forward until a stretch is felt, keeping the trunk upright. Maintain this position for at least 20 seconds, and repeat this 3-5 times on each side. ↑ 1.0 1.1 1.2 1.3 1.4 1.5 1.6 1.7 1.8 1.9 Kwong Y. et al., MDCT Findings in Baastrup Disease: Disease or Normal Feature of the Aging Spine?,American Journal of Roentgenology, 2011, 196(5):1156-9. ↑ 3.0 3.1 3.2 3.3 3.4 Singla A. et al., Baastrup’s disease: the kissing spine, World Journal of Clinical Cases, 2014, 2(2): 45-47. ↑ Yang A. et al., Kissing Spine and the Retrodural Space of Okada: More Than Just a Kiss?, University of Colorado, 2014, 6(3): 287-9. ↑ Han K-S., Biomechanical roles of spinal muscles in stabilizing the lumbar spine via follower load mechanism, ProQuest, 2008, 92-95.